Why was he in the news? 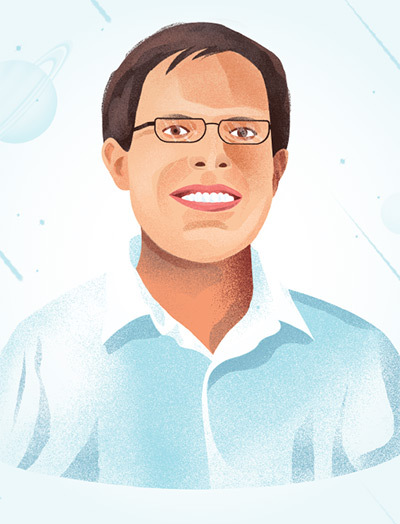 Brian David Metzger, 03BS, is an Indiana Jones of astrophysics. While pursuing some of space’s deepest secrets, he and a team of intrepid astronomers and astrophysicists struck gold, tracing its origins—and those of all other heavy metals in the universe—to the explosive swan song of two dying stars. “I’m involved because I’m ‘the kilonova guy,’” says Metzger, who majored in physics, astronomy, and math as a University of Iowa undergraduate and now is a theoretical astrophysicist at Columbia University. He coined the term “kilonova”—referring to the collision of two neutron stars—in 2010, before scientists had ever actually observed such an event. When they finally witnessed one last summer, Metzger’s Harvard astronomy colleagues invited him to join the international consortium of scientists who were analyzing the incredible occurrence. On Aug. 17, 2017, an intergalactic “chirp” traveled 130 million light-years to Earth, setting off interferometer detectors, which identify space-time ripples caused by gravitational waves. This unexpected cosmic vibration first triggered the Virgo detector in Pisa, Italy, at 8:41 a.m. Eastern time, and milliseconds later, it pinged the two Laser Interferometer Gravitational-Wave Observatory detectors in the United States—one in Washington state and the other in Louisiana. News of the alerts spread like wildfire among more than 70 astronomy laboratories and observatories across the globe and sent scientists gazing giddily skyward, trying to pinpoint the location and source of the ripples. According to Metzger, this event has ushered in a revolutionary era of “multi-messenger astronomy,” because, for the first time, scientists have been able to analyze both gravitational and light waves from the same event. Using such fundamentally different information to explore the universe gives astronomers and astrophysicists a much more holistic way to study the skies. “We have a new astronomy laboratory now, and that’s a big discovery in itself,” he says. A UI spin-out company helps farmers keep their pigs safe.